A nice straightforward offering from Dac this week, as enjoyable as always, and as good as ever. What more is there to say? We’re spoilt every Wednesday. There were only the two I couldn’t parse – 22ac, because I would struggle to name more than a handful of car models, and 11d which I probably would have if I’d persisted, but well, that’s what Fifteensquared’s there for. I half wondered if 26ac might have indicated some sort of topical, thematic choice of puzzle, but no, it appears to be a happy coincidence. Brrrr. Hands up who has a 2d in their kitchen, and who else expected 1d to be democrat. COD? 15ac – “Sort of fab girl that I love? Not half (1,3,2,3,5)”. Saturday 17th February, the day of the great earthquake. Well, the earth moved for me, anyway. Was this an omen, because who stole all the bars from that grid? Oh, it’s a jigsaw, and I never have the first idea about how to set about filling the things. For added entertainment value all but sixteen of the clues will be entered with blank cells between some of the letters. The others? Eight acrosses need a word removed from the clue before solving, eight downs a single letter wherever it appears. Dive in, and start cold solving. How much joy did this fill me with? After an hour I went to clean the car instead and then watch a DVD. Because putting off actually solving the thing will lead to flashes of inspiration? Not really. The night ends with lots of clues solved, and lots of excised words from the acrosses – fiasco, pineapple, malware – that appear to have nothing at all in common, and lots of excised letters from the downs. Here we do have a pattern – they’re all N. Which tells me absolutely nothing. The grid? Well, that’s completely blank, because, well, see my comments regarding this sort of puzzle in the first paragraph. Fast forward to Sunday evening. Solve a few more clues. Think to hell with it and start lobbing some of those answers in the grid. The first across in the first row and let’s see how we go from there. Chaotically is the answer to that preceding a careful re-read of the preamble. Those are blank cells, not ones where we start trying to haphazardly cross clues. At which point things start to make a little more sense, and some sort of shape emerges, a possible pattern to the blank cells. A curve of some description. The answers from the sixteen amended clues it also becomes clear are a major boon, anchors in a pretty chaotic mess of penciling ins and rubbings out. A bit of a debacle down in the SW corner ensues until it becomes clear that RAND is not in fact RAND but MINT. Which is the sort of thing which happens when you haven’t got any crossing letters until the close to work with. Though with some in place, and clues that are on the easier side to compensate for the amount of cold solving, the last few downs go in at a rate of knots. Some straight lines begin to emerge amid the blank cells and… Of course, it’s the CND symbol. I’ve still got the badge somewhere to prove where my sympathies lay. We need to highlight a name? 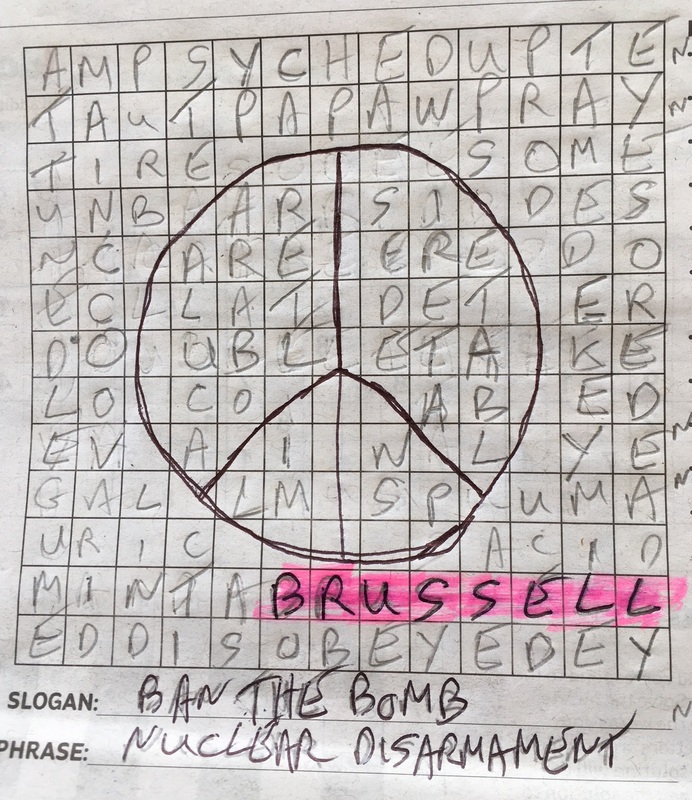 There’s B RUSSELL obviously in the SE corner – CND’s one and only president apparently. The slogan? Shell, attack, pineapple could all equate to bomb, I suppose, though I’m not sure about some of the other excisions. So BAN THE BOMB. The phrase? N for Nuclear in all the downs. NUCLEAR DISARMAMENT. See, I can do this sort of thing. Feeling quietly pleased with myself I draw the symbol, highlight the name, fill in the slogan and phrase. And you know what, I enjoyed filling the grid too, despite an initial moment of utter desperation upon noticing the lack of bars. Thanks Serpent for a thoroughly enjoyable solve. All of which takes me back to the heady days of the earlyish ’80s, and this infamously banned video. Radian was the most prolific supplier of Tuesday crosswords in the i last year by a comfortable margin, but this is his first of 2018. A welcome re-appearance, and this one is a corker. It all revolves around this lady, represented by the rather impenetrable 23ac, so my way into the theme was by way of 29, then 27 at which point the penny dropped. The poet’s daughter in question is well known I thought, but quite a few of the Fifteensquared brigade did not agree, so maybe not. Anyway, nice to see some broadly scientific content for a change: C P Snow would approve. The puzzle first appeared in 2013 on 15th October, which turns out to be 23ac’s Day: an annual celebration of women in science, technology, engineering and mathematics. I’m indebted to the estimable duncanshiell for that nugget of information, whose contributions on the other side are always impeccably comprehensive. So as we shiver awaiting the fabled beast from the east, what better way to warm up with a fairly easy-going puzzle from the Don. I’m guessing this was about the fastest I’ve solved an i cryptic with the answers fairly flying in, which leaves little to say except that it was fun while it lasted. In common with flashling back in 2013 I was a little uncertain about the parsing of 17ac, but in retrospect I don’t seem to have missed anything. A good puzzle to show to anyone who’s thinking of taking up the dark arts of cryptic crossword solving. COD? Just because the memories of that sketch raised a smile, 20d – “Mimic bird (like e.g. dead parrot!) (7)”. Last weekend’s Phi had something of the feel of a barred puzzle, I thought. Not so much the wordplay elements, which were straightforward enough (deletions and anagrams abounding as per), but rather the solutions – especially those animals – which presumably took up residence in some of the remoter corners of Noah’s Ark. At any rate I don’t remember the Sumpter, Green-drake, Alevin or Sterlet in any of the illustrations from my Children’s Bible. Leaving aside all that, and the description of Noah as an ‘historic’ sailor (hmm), I found this to be a very enjoyable ruse indeed. The animals did indeed come in two by two, paired and orderly with Noah/S’ark to hold them in place. Lovely. And no shame in using dictionaries last week – this was a fun challenge and just right for a Saturday. All the answers, a different leader of the UN in 18d, and some input from the setter can be found here. A reprint of a Thursday puzzle from Klingsor and not quite as difficult to solve as might be expected although parsing some of them needed our friends over at Fifteensquared help especially in my case 14ac and 13dn. A slow start with nothing going in until 18ac although I thought Of Dacha I couldn’t see why and I dismissed Eland as well thinking it too obvious ho hum. The down clues proved more lucrative and it was all over perhaps too soon with 13dn being the LOI. The only grumble would be that a lot of the clever cryptic parts were missed by me as with a few crossers in the answers seemed a bit obvious and only a secondary reading brought an appreciation of the clueing. Tees is a setter I often struggle with so I might have been heard to utter a groan when I quickly checked today’s cryptic in the queue at Tesco. 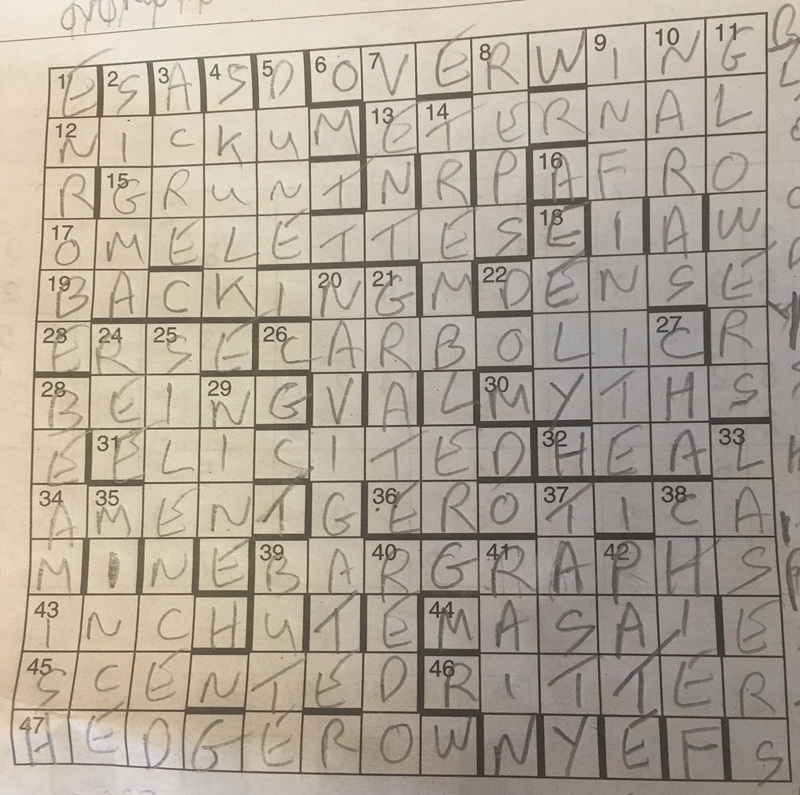 But perhaps this is a good case for not publishing names above the puzzles, because as it turned out this was a perfectly accessible and thoroughly enjoyable crossword with lots of smiles, and lots of ticks beside the clues. I know my Science Fiction so 13ac was no problem at all, and only briefly paused to consider 27d, which was unfamiliar; 17ac, though it obviously had something to do with COB; and 10ac where I considered for one moment of madness SARBU as a possible contender. 7d was my LOI, and here I did struggle somewhat – don’t tell my wife, as her name features in the wordplay. Elsewhere I only vaguely managed to work out what was going on with 8d while solving, though it could be nothing else. 4d was a case yet again of being too close to the subject matter – despite living in Wales for over 48 years, the only Ivor I’ve come across is Ivor the Engine, with the result that I needed all the checking letters in place. COD? Lots of ticks today, and I did quite like 19ac, but my COD goes to 1ac – “Glob? (5,7,3)”, which seems to me to be quintessential Tees. A little on the challenging side today for Dac I thought. When I’d gone through all the across clues without an inkling as to how to solve any I guessed that I might be in trouble, and my first one in, 7d, did little to help matters, because it was really in the SE that I began to make progress. A few odd words in the NE perhaps didn’t help – EQUIPE and ALEVIN – though both were very clearly clued and perhaps on another day I would have got them without needing checking letters. A little German required for 2d if you couldn’t remember the driver – though thankfully I could, as it’s not in Chambers and I would have been a little stuck otherwise. A few question marks at the close, all of which are ably cleared up over on the other side. A substantial number of ticks too as ever on a Wednesday, with COD going to 17d – “Could this be viewed as a ‘female’ film? (4,3)”. Nudd? Nope, not a name that rings a bell. Fifteensquared’s handy index to the rescue – yes, it’s been a couple of years, way before the start of my Inquisitor solving career, shambolic though it might be. Will we be left with a sinking feeling at the close or buoyantly upbeat? The preamble looks straightforward enough, extra letters in each clue spelling out a quotation and speaker. So far so pretty standard for the Inquisitor. Hang on, 13 clues that will need to be amended before entry. There’s the joker in the pack. Put in some earphones, chuck on Bend Sinister, and let’s look at the first across, being 6. Nope, can’t make sense of that – it looks like an anagram, but nothing that fits that length. 12ac? Not that one either. 13ac has got to be ETERNAL though, hasn’t it? Yes it is, and we’re off. An easy hidden at 8d, another obvious definition at 9d, this is looking good. Except that there are loads that aren’t looking so easily tractable, and that sinking feeling begins to set in. Presumably some of the 13 entries that need amending are in there somewhere because I haven’t found any yet. Take a deep breath, take stock. Have something to eat, try a different puzzle for a bit, cue This Nation’s Saving Grace and LA. What’s going on here? First thoughts – some definitions don’t match up with the wordplay. Definitions literally sinking? Nope, that’s not going to work. What about that wordplay then? Well, 6ac could be OVERWHELMING, couldn’t it? The checking letters we’ve got mean that OVERWING would be a viable grid entry. HEDGESPARROW will work for 47ac, with HEDGEROW in the grid. That’s HELM and SPAR overboard, a most definite nautical theme. What about those extra letters? Well, I’ve got a few, if not all. What happens if we start Googling what we’ve got, which handily is the first bit of the quotation. Which is a paraphrase of Admiral Beatty’s (there’s the last word from those extra letters) infamous quote at the Battle of Jutland. So we’re jettisoning bits of ships? This proves to be easier said than done, especially for my last two – 15ac and 19ac – where a little reverse engineering and scouring of the big red book is in order. We’ve got all the extra letters now, which means the rest of the clues are a doddle, sort of. Those ship bits in full, in no particular order. GAMMON, CHOCK, BOW, KEDGE, PARRAL, VANG, STERN, SPAR, MAST, HELM, POOP (sniggers), BRIDGE, HOLD. No problem for the nautically minded among us I’m sure, but a few left me feeling all at sea and reaching for the nearest dictionary. All’s well that ends well, though, and we were left safely on dry land, even if I was left staring at the last two clues well into the night, though to be fair with most of my attention on a film, and only a little on the dictionary and that lightly pencilled grid that began to look lighter still as the night drew on and the inadequacies of the energy saving bulb became patently clear. No doddle then, and not a Harribobs either, but something that’s just, sort of, maybe in my comfort zone, if there’s such a thing as an Inquisitor comfort zone. Crosophile’s crosswords haven’t always been to my taste, but I’m more than happy to give him credit for being a very clever setter. Just how sneaky he’s been is not readily apparent today, but keep looking. There’s a mini theme and some other things to be found – but if you draw a blank the man himself hints at it in his comment on the October 2013 Fifteensquared blog, to a chorus of groans from the others.